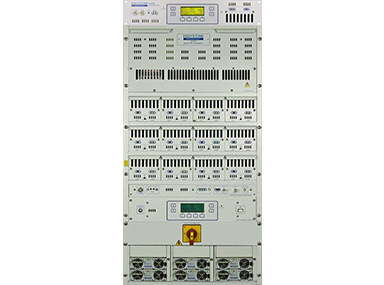 FULL DIGITAL INTERFACE AND CONTROL, Modular Series, Frequency Agile - User can select any channel from 87.6 MHz to 108MHz. Digital Auto Power Control - Output power is maintained at your selected level, both forward and reflected power are displayed on the front panel. Display - Blue colored screen provide easy viewing off all parameters under high ambient light. 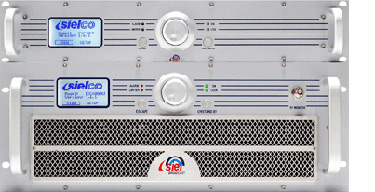 State of the Art DIGITAL EXCITER and HIGH QUALITY BROADCAST DIGITAL STEREO ENCODER. Transmitter fulfills CCIR AND FCC standards. 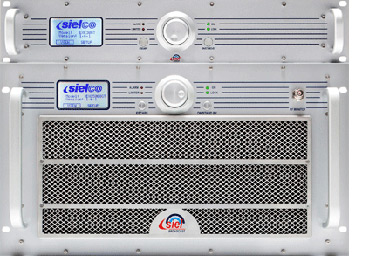 Extensive transmitter protection minimizes system downtime. Complete redundant design with automatic failover control. Light weight design and plugin play configuration allows users to be online just seconds. Eddystone Broadcast FM transmitters is an evolution of the highly modular architecture for which Eddystone Broadcast transmitters are known. The use of hot-pluggable Power Amplifier modules means that removal of amplifiers can be carried out with minimal reduction in output power. Hot-Swappable power supplies allow for quick replacement while keeping you on air. Eddystone FM Transmitters provide high performance, excellent control and monitoring and maintenance free operation. Our transmitters utilize a unique ultra linear modulator to give superb sound reproduction with freedom from overshoots and artefacts. Very conservatively rated components and a switch mode power supply are used to ensure extremely high reliability and to give good efficiency. Eddystone Broadcast RMU enabled FM transmitters can enable your Network Operations Centre and authenticated Engineers to remotely view and manage any transmitter system. - Simple servicing, module hot-swaps possible by non-technical staff. - The highest module redundancy of all our competitors. - All transmitters from 500W to 20kW use the same PA and PSU modules. - All modules are hot-pluggable. - All modules has individual control and monitoring. - The time needed to replace a faulty Power amplifier or Power supply module is less than 20 seconds.